To suit the special requirements of the United States Navy, the Mk5 seat was introduced in 1957 and its production paralleled to that of the Mk4. 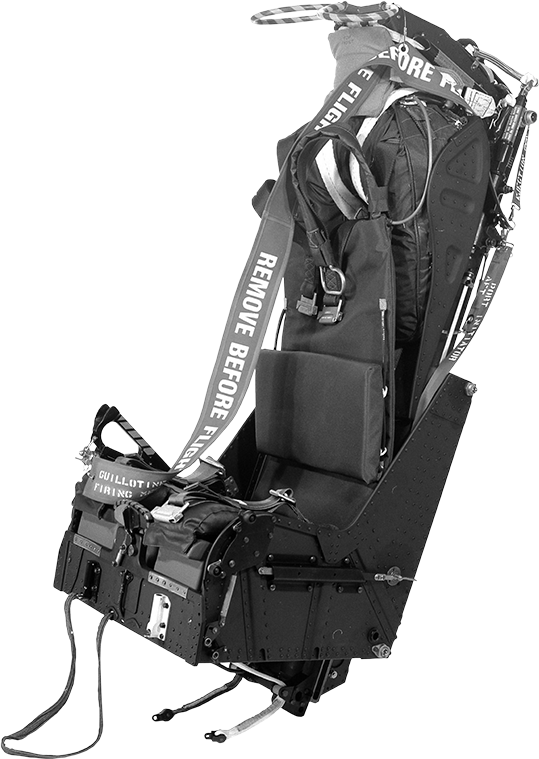 In general, the Mk5 seats conformed to the same basic pattern of the Mk4 and included the standard 80 feet per second gun, 1¼ second time delay with g switch and barostatic control, duplex drogue system plus all the other features necessary for their use at all speeds and heights. To meet specific American crash requirements, however, the seat structure and harness were strengthened to withstand deceleration loads of 40g, instead of the 25g British specification, resulting in a slight increase in weight. In addition, the seats were provided with special canopy breaker peaks on the headbox to provide for the eventuality of having to eject through the canopy, standard practice on the A.5 seat installed in the Grumman 9F-8T Cougar. On the majority of the other Mk5 seats, the American system of jettisoning the canopy was linked up with the face blind firing handle. The low-level capabilities of the Mk5 seat were successfully demonstrated in August 1957, when Flying Officer Sidney Hughes ejected from a Grumman Cougar at the U.S. Naval Air Test Centre, Patuxent River, before a group of high-ranking U.S. Navy Officers. Subsequently, the decision was made to standardise the Martin-Baker Mk5 seats for all United States Navy jet fighters and trainers, and many fuselages were sent to the Company’s factory at Denham for trial installations. North American Sabre and Republic Thunderflash aircraft of the Norwegian Air Force were the first of many N.A.T.O. aircraft to be flown into Chalgrove Airfield where the installation of Martin-Baker Mk5 seats was made, replacing the original American ejection seats fitted in these aircraft, because the Norwegian Air Force preferred Martin-Baker seats. Altogether the Mk5 seat has been fitted to nearly twenty types of American aircraft, including such advanced aircraft as the McDonnell Phantom, L.T.V. Crusader, and Grumman Intruder. After initiation of time-release unit, the plunger releases scissor shackle to transfer pull of drogue to lifting lines of parachute, releasing it from seat. Manual separation system available if necessary. 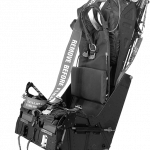 Operation of manual separation handle fires a cartridge that operates a guillotine, severing the parachute attachment line, linkages function releasing parachute harness, negative-g strap, PEC and leg restraint cords.